This book is a compilation of marriage and divorce laws from various personal laws as well as secular statues of the country such as Hindu Marriage Act, Indian Divorce Act, and Special Marriage Act etc. Since the last edition, there have been several case laws developments on the law of marriage – especially Hindu and Muslim Marriage Law, including the controversial subject of triple talaq under Muslim Law. Besides this technology has also played a role in requiring the law to evolve to consider circumstances such as divorce through video conferencing etc. The publication caters to only one aspect of personal laws i.e. Marriages and Divorces, which forms bulk of family law litigation and practice. This book is a one-stop-shop for practicing lawyers who handle marriage and divorce cases under Hindu laws, Muslim laws, Christian laws Special Marriage Act, Jewish laws, and Parsi laws. 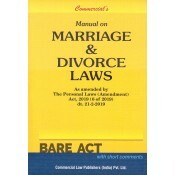 Single volume commentary on personal laws of India relating to marriage and divorce. 10 Chapters cover commentary on personal laws pertaining to marriage and divorce under the Hindu, Muslim, Parsi, Christian and Jewish Law as well as provisions under Special Marriage Act and Foreign Marriages Act, Family Courts Act. 53 Appendices include all relevant Central and State Laws relating to marriage and Divorce. Model forms of petitions provide practical guidance on the interpretation and application of these personal laws. It is updated with case laws up to February 2017 and State Acts and Rules have been updated. 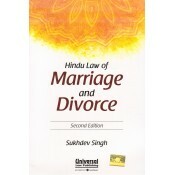 The book Hindu Law of Marriage and Divorce envisages the myriad dimensions of marriage under the pur..